One of the current trends that we have been seeing more and more is long tables at receptions and parties. The tradition of having a long wedding head table has even changed to a rectangular king’s table with wedding party sitting all the way around instead of only on one side. This idea has trickled over into the whole reception and we are now seeing room layouts and celebrations with 8ft. to 16ft.+ tables, guests seated at all sides. 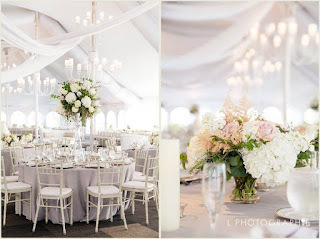 The look of the overall room is stunning with the long tables lined up and table decor trailing down the center. This trend is fun to work with and design for, but there are a few things to consider when it comes to the flowers and table decor. To us, this visual is one of the main draws to doing the longs. This is such a romantic and lush look and when you envision this in your whole reception, it’s breathtaking. The cost can sometimes also take your breath away if you don’t know what to expect. In the case of long tables, oftentimes two 8 foot tables are connected to give an even longer profile. Sometimes, they are also doubled up in width to give more room for the guests sitting there. If the table is 16 feet long, the real estate that needs to be covered to give the same fullness as mentioned on the round tables is exceedingly more. 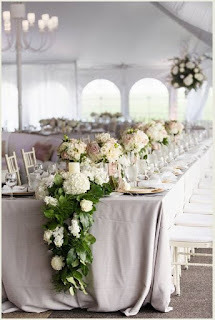 If you want garlands down the center, 16 feet won’t drape over the edges, so 20-22 feet per table would be suggested. Basic greenery garlands that are pre-made with 2-3 types of greenery can range in price from $12-18 per foot in our market. Adding flowers to the greenery will start in the neighborhood of $15 per foot (additional) and increase from there depending on flower choice and fullness. Of course, different shops have different price ranges, so check with them. Solid flower garlands are also popular on social media, but are much more expensive than those with greenery included as a large number of blooms are needed to construct them. If garlands aren’t really what you envisioned for your long tables, another popular look is several small arrangements and candles aligned down the middle. The coverage of these table scapes is usually pretty full with one arrangement running into the next accented by candles. 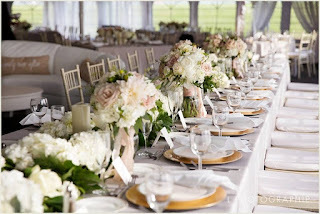 If you budget one small arrangment for every foot, then you would need 16 vases of flowers plus candles for each table. As always, the range of prices will vary with flowers choices and size ( approx. $40-100+ each), but keep in mind that whatever elements are being incorporated will need to be purchased in multiples to achieve that look. There are lots of variations as well. Some choose to sit guests on each end of the longs. Having a place setting at each end of the table decreases the length of decorations needed as well as the tendency to want any garlands draping down the sides of the table. Some also mix round tables and long tables in one room to have the best of both worlds. Whatever your vision may be, think past the table shape and explore how best to showcase your table scape!